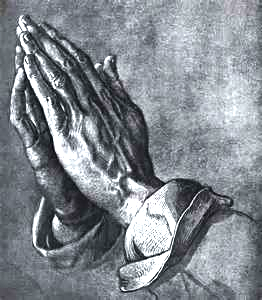 “The Praying Hands” is one of the most well-known and loved paintings of any artist in the religious field. The artist was Albrecht (Albert) Durer, circa 1508. Albert was the son of a Hungarian goldsmith and an apprentice in his father’s trade. His great ambition was to be an artist. After several years working with his father, he finally was able to be on his own; however, making a living and studying art proved to be rather difficult. Fortunately, he was able to find a man, much older than he, who was a painter and whose ambition was also was to be a great artist. The two felt that if they lived together, they could work and study with less difficulty, but this did not work out as planned. The older man suggested that one should work and the other study. Since he had a job in a restaurant, the older man said that he should be the one to continue working. Albert could then study further to pursue his goal to become an artist. Finally, the day came when Albert sold a wood carving and earned enough money for him and his friend to live in comfort for a while. The older man felt that now he would be able to study and become an artist like Albert. This is when the older man discovered that because of the long years of hard labor, the muscles in his hands had become stiff, the joints enlarged and fingers twisted, and he could no longer hold the brush to paint. One day when Albert returned to his room, unexpectedly, he heard the older man’s voice in prayer and saw his work-worn hands clasped together. When Albert saw his friend’s hand in that position, he felt a deep sorrow at how much his friend had sacrificed those many years as a labor of love for him. His immediate thought was to paint the hands of this older man to express gratitude for this sacrifice. “Praying Hands” is then the result of sacrificial love, true friendship and undying loyalty. My prayer is that we, too, will clasp our hands and pray for one another in times of joy and sorrow. 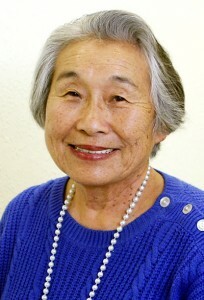 Maggie Ishino is a staff typist for The Rafu Shimpo. Opinions expressed are not necessarily those of The Rafu Shimpo.